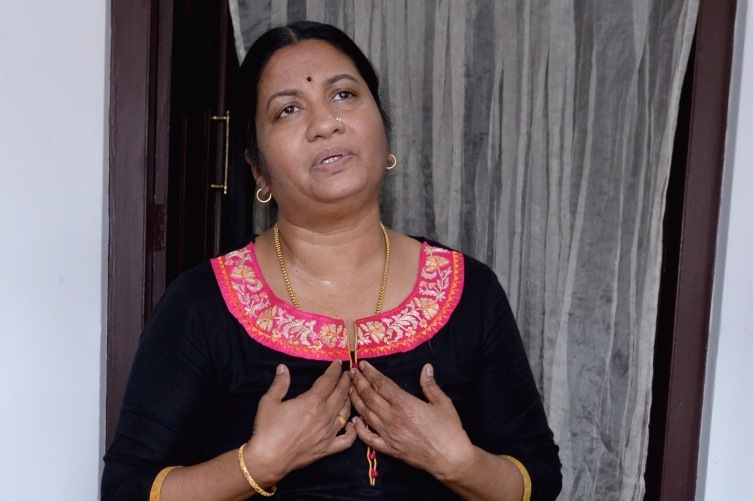 “Nimisha was a simple girl who used to love wearing salwar kameez,” says Bindu, as she explains the events which shook her family and have sent shock waves across Kerala. “When she came to tell us in November 2015 that she was in love with a man named Isa from Palakkad, she came in a burqa. My daughter is missing now, and newspapers say she has joined the Islamic State. Will the police help us?” she asks, as her voice quivers with helplessness. Twenty-five-year-old Nimisha, a fourth year BDS student at a college in Kasaragod converted to Islam last year. She is one of 17 people from Kerala who have gone missing, and there is palpable fear that all of them, including a few couples and children, could have joined the Islamic State. On Saturday evening, three more complaints have been filed, which could eventually take the count to 20. Kerala DGP Loknath Behra says that their links to the Islamic State have not been proven yet, but what is emerging is a complex tale of conversion and religious brainwashing, which led them out of the country. The News Minute has spoken to five of the eight families involved to weave all the stories together and establish the connections between those who have gone missing. Who are these people? How did they know each other? And how did they get radicalized? It all started with a message that a man named Hakeem who lives in Kasaragod got from his son 23-year-old Hafeesuddhin Theke Koleth on Eid. The message sent via the Telegram app said that he was now in a Sharia country and all was well. The message itself and Hafeesuddhin’s demeanor during the last few weeks towards his family led Hakeem to suspect that his son may have joined the Islamic State. “I know my son. He does not follow Islam like I do, he is far more radical. I have seen him changing over the last two years, which is why I won’t hesitate to say that he could have joined a group like IS. My son was a simpleton, but I cannot deny that he had changed,” Hakeem told The News Minute. Hakeem approached Kerala Chief Minister Pinarayi Vijayan, and that was when the story began to unravel. Hafeesuddhin and his friend Marvan Ismail had left their houses in May 2016, they had told their families that they were off to Kozhikode for a class on Islam. They have been missing ever since. Brothers Ijaz and Shihaz and their wives Rihaila and Ajmala, from Thrikarippur. Around the same time Hafeesuddhin and Marvan went missing, Hakeem’s neighbours Ijaz and Shihaz too left their homes. Ijaz was a doctor married to Rihaila and had a two-year-old child. His brother Shihaz was married to Ajmala. The five of them left for Sri Lanka in May, stating that they are going for an Islamic course. They have not returned yet. A cousin of Ijaz and Shihaz, Ashfaq, was a businessman in Mumbai. “Ashfaq was managing his father’s lodge in Mumbai. He had come back to Kasaragod four months ago and had announced that he would not go back to Mumbai. In May, after Ijaz and Shihaz left for Sri Lanka, Ashfaq also left with his wife and baby,” a relative told TNM. 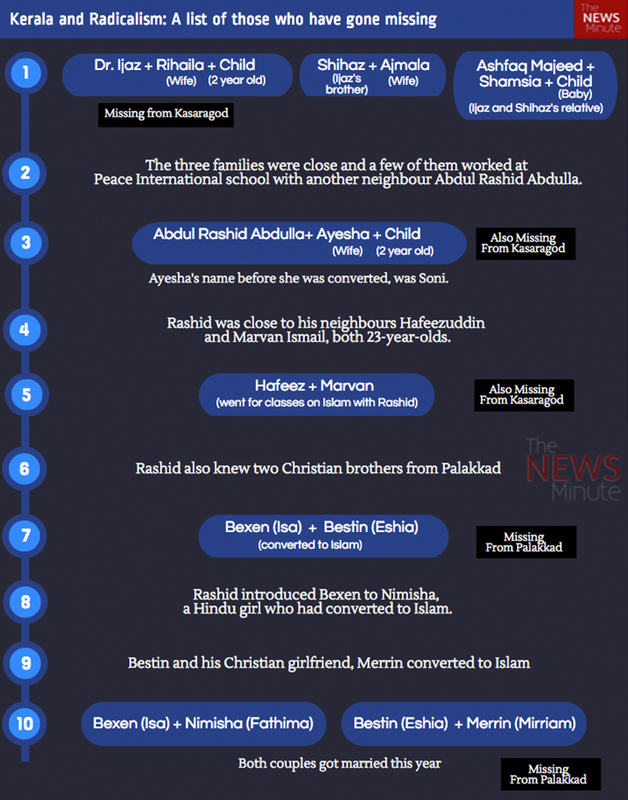 The families of Ijaz and Hafeesuddhin confirmed that 29-year-old Abdul Rashid Abdulla, their neighbor and a teacher at the Peace International School, was the man who motivated them to leave the country. Rashid seems to have been the sharp evangelist, who lured people from other religions into Islam, and radicalized other Muslims. His wife Ayesha, was a Christian before marriage, and completed her Engineering degree from Ernakulam and MBA from Bangalore. “He is the main guy. He was working at Peace International and made them all join the same school. Ijaz, Shihaz and even Ashfaq’s wife have all worked with Rashid at Peace International School,” confirmed Mujeeb, a relative. Initially, it was believed that the radicalization was confined to a few Muslim families living in a single panchayat. But here’s when things get tangled. Soon enough, parents from Palakkad, Ernakulam and Thiruvananthpuram came out declaring that their children had also gone missing in May. Thirty-two-year-old Bexen from Yakkara in Palakkad was an MBA graduate, but was unemployed. His brother, 24-year-old Bestin, had worked in Peace International School, Kochi for a while and then quit. Last year, the two started growing their beards and wearing shorter pants. When their parents enquired, the brothers revealed that they had converted to Islam. Bexen had become Isa and Bestin was called Eshia. In December 2015, Bestin (Eshia) went away to Sri Lanka with his wife Mirriam. “They returned in April and from then on they had been constantly travelling. 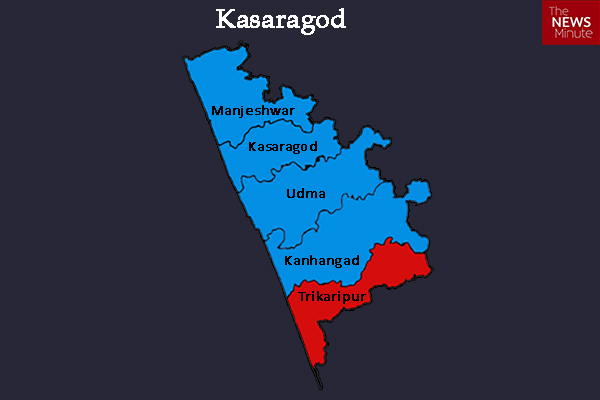 They kept going to Hyderabad, Mumbai and Kasaragod. In May this year they told us they were leaving to Sri Lanka,” Elsi, Bestin’s mother told TNM. Twenty-two-year-old Mirriam, Bestin’s wife was born as Merrin in Kochi. Her father owned a medical shop in Kochi. In May 2015, Merrin left for Mumbai after getting placed with IBM. She returned home in September 2015 as Mirriam, and told her parents that she had converted to Islam. “Merrin and Bestin were friends in high school and they had an affair. But they fell apart after Bestin started eulogizing Islam. Merrin told me that Bestin (Eshia) came to Mumbai and convinced her that Islam was the best religion in the world and she had to convert. He used to take her to a friend’s (Ashfaq) house. The friend and his wife were instrumental in convincing my daughter,” Merrin’s mother Mini told TNM. Merrin (Mirriam) and Bestin (Eshia) got married sometime last year. “He brought Mirriam home. We could not do anything other than accept her,” said Elsi, Bestin’s mother. In Thiruvananthapuram, K Bindu lives next to the famous Attukal temple, and her family, for years, has been part of the temple management. While her son is an NSG commando, her daughter Nimisha was a student of dental sciences at the Century Dental College in Poinachy. This is the same college in which Rashid’s wife had studied a few years ago. “Someone in the college runs a Seva group that takes students to other districts to help cancer patients and others. She had many Muslim friends and they would even come and stay over. Why would I ever suspect that something was going on? This Seva group was nothing but a way to brainwash kids. In November last year, my daughter came home. She was in a burqa and said her name was Fathima. She told me that she was marrying Isa (Bexen),” Nimisha’s mother Bindu told TNM. It all happened in a flash. Nimisha (Fathima) and Bexen (Isa) went to live with his parents in Palakkad. By then, Bexen’s brother Bestin too was living in the same house with his wife. Rashid’s connection emerges here too. “We did not know this girl Nimisha at all. Rashid used to come home frequently and our sons used to go with him to Kasaragod. One day he told Bexen (Isa) that he had found a Muslim bride for him. In November, they both got married,” says Bexen’s father Vincent. Bindu had, in May, met a pregnant Nimisha (Fathima), who assured her that she was leading a happy life with her husband and his family in Palakkad. “She used to speak to me every day till May. Then one day she informed me that she and Isa were going to Sri Lanka, to which I objected. But she messaged me on WhatsApp in June saying that they have reached Sri Lanka, but refused to disclose the location,” Bindu said. 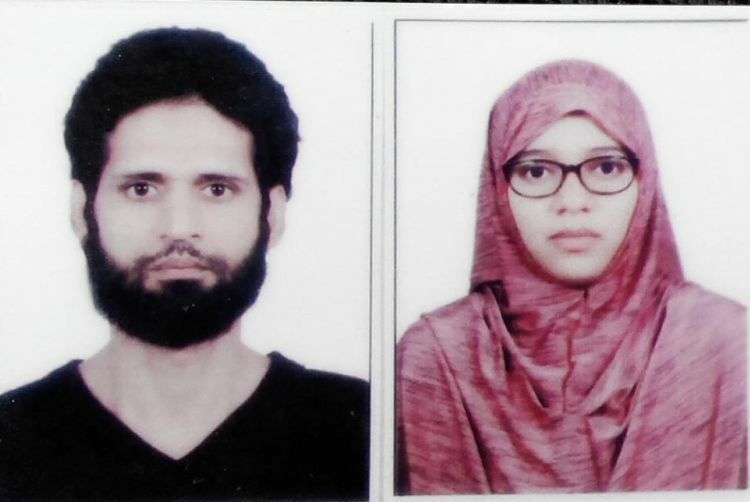 While their stories indicate strongly that they could have been radicalized in a systematic way and led out of the country to live under Sharia law, Kerala police have cautioned against any speculation. What the family do state clearly is that these men and women were led to believe in the ‘purity’ of the Sharia law and convinced to get back to their ‘roots’. DGP Loknath Behra told TNM, “They may come back to Kerala; we cannot assume that they have joined any organisation. The conversion angle will be looked into. It is not right to brand them as having joined any organization till an investigation proves that”.